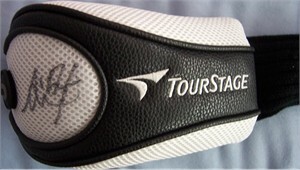 Authentic TourStage headcover (for a 3 wood) autographed in black marker by Japanese LPGA superstar Ai Miyazato, who uses and wears TourStage golf equipment, which is sold mostly in Japan and hard to find in the United States. This is a completely legible Ai 54 autograph that she no longer signs. With certificate of authenticity from AutographsForSale.com.